Detroit Mayor Dave Bing announces EMA contract at press conference with (front, l to r) Board of Water Commissioners (BOWC) chair Mary Blackmon, DWSD Director Sue McCormick, Bing, BOWC chair James Fausone, and Detroit City Councilman Gary Brown (a member of Judge Sean Cox’s secret “Root Cause” Committee). DETROIT — As a group of busy people, we have gotten used to ‘l told you so’ in many aspects of our lives. This is particularly true in politics and political corruption. You don’t have to go too far to see this in our community. Just look at the Kwame saga being played out in our City. Ficano’s dealings are another example. There are others in our community like John McCulloch, Tony Marrocco, Engler, McNamara, Duggan, Jase Bolger, Roy Schmidt and many others. Corruption is not an expertise of any one party, it is an equal opportunity phenomenon in our system. Just see the influence of Moroun over the bridge issue – everybody knows how he has bought out Republicans on this issue, but nothing happens to these people. These Reps’ only constituent is Moroun! Protesters blockade the Ambassador Bridge last year. lt is a disgrace. It is also not a race or a gender issue. You will find fresh examples of both within our community. By this time we are all familiar with the routine. The press keeps praising the guy who by whatever means twists the system to get advantage and lines his/her pockets. While ignoring the obvious, the press touts the accomplishments and knowingly (while appearing to be doing good reporting and following the journalistic standards) participates in the whole sham, and then ‘boom’! Things fall apart! Revelations! Wrong doing! And the rest of the sensational crap to sell the paper. Big business! Until you let it build up to a level of juicy story line they would not expose any such issues. in Aug. 2004, which created a huge sinkhole and released millions of gallons of raw sewage. 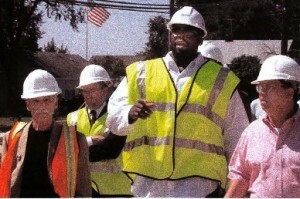 Shown here with contractors repairing the break are former Detroit Mayor Kwame Kilpatrick and former DWSD Director Victor Mercado, both now in federal court on corruption charges. Current Detroit Mayor Dave Bing’s administration and the City Council later gave the Oakland-Macomb Interceptor to those counties at the directive of Judge Sean Cox. While the Kwame and Ficano circus is in town, we have the foundation for another circus being laid out right here in front of our eyes. 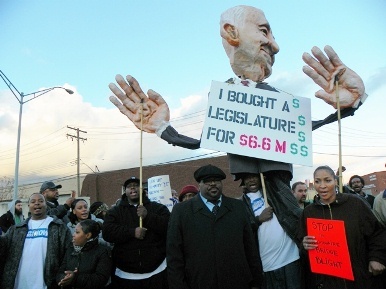 The battle is for City’s coveted and controversial DWSD. This department deals with so much money and projects that every politician is after its control – whether it is Monica Conyers or John McCulloch or Kurt Heise – all in the name of better: and more efficient system. The equation is simple. !f you control the projects coming out of it, you can squeeze more money out of contractors and build your own empire and ego. This all is done in the name of good governance. This is not the question of Detroit vs. suburbs. Again, it is an equal opportunity proposition to fleece the system. lf you have doubts about it, just do your own research and find out who has gotten the contracts at the Oakland County Water Resources commission (OCWRC) in last five years and then compare those names to the names of the donors (including friends and families of the contractors) and you will figure it out for yourself. Do the same for Macomb County Public Works Commission (MCPWC). This information is not that difficult to track for the reporters. For a common person, it would be a bit overwhelming as we need to make our living too. The press knows about it too. But, they are part of the system feeding off the crumbs thrown at them by the big dealers of our society. 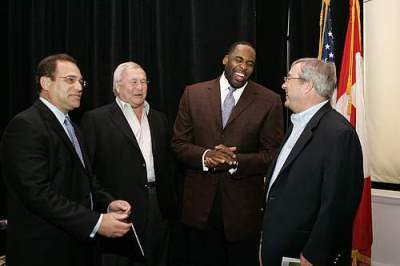 Just think about it – if you or I had given $5000 cash to Kwame, we would be in big trouble with the feds; our so called leaders of the SE Michigan have each given at least $25,000 in CASH to him – this is the known fact. What happened to them? Well, they got more City and government contracts. The whole system is rigged. Back to DWSD . . . Now there is another player in this power play by the name of Judge Sean Cox. Cox’s name has a long history with Detroit, and it is not pretty. 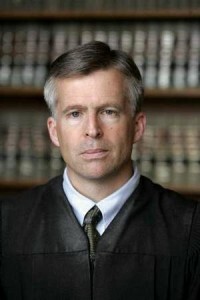 This Judge and Detroit COO Chris Brown have systematically played up the Clean Water Act ‘compliance’ card and have started dismantling the department. They have used the threat of broad powers of a federal judge to manipulate and take the department apart. First, they removed a very competent Chair of Water Board Commissioners. They created a secretive ‘Root Cause’ committee with a gag order (This is not a jury case to be tried that you would need a gag order, but he used the tool to cook his own deal). Then he installed his own Director, who, by all reports to date, is a very incompetent individual with a very limited knowledge of the system. Then they hired a COO, and a counsel – all without the Board’s knowledge – from Wayne County’s corrupt system. But the latest act has to top it all. The Director hired EMA to do a 90-day study to assess the Department for efficiency improvements using a $150,000 contract – awarded without following proper procurement procedures – no-bid contract. EMA, a Minnesota based firm with its core staffing out of Toronto, Canada, conducted cursory interviews with some 200 employees (out of more than 1900) and developed a report (which is a secret) and did a power point presentation to announce an 80% staff reduction at the department! They apparently missed the report deadline by several months. Based on this conceptual plan, Chris Brown and the Mayor held a press conference and announced the findings of a ‘conceptual’ study to the world. The knowledgeable people who heard of such an absurd report were shocked. The report behind this presentation is still a mystery. The shock and awe treatment did not stop there. Responding to such harsh criticism, the report was retracted and revised to a more modest reduction in staff. Again, it was done in a hushed manner – it is still a secret. Apparently, this report has so many holes that you can drive a lot of sludge through it. All this is being done at such a whirlwind speed that the Board members are awe-struck and have nothing to rely on. lt is obvious that their arms are being twisted to go along with the plan, or else. The height of the drama came when the Board arranged for a special meeting on a Friday morning at 10 (typically Board meets on Wednesday afternoons) to discuss the EMA proposal and vote on it. The agenda was quietly slipped on to the website late Thursday afternoon. The agenda talked about a single contract for the Board’s consideration. It was for a $48 Million dollar contract to EMA. There was no request for proposal prepared by the department, no in-house scrutiny; there was no other solicitation; there was no scope outlined by the department. The Board was totally clueless as to what hit them. According to the Judge’s order, this contract must be approved by the City Council. No one knows if they will get their approval. The Council is clueless on these issues (they are busy fighting each other while the City is being sold at scraps). The plot thickens further. As it turns out, EMA was brought in by Mr. Butler Benton, the famed retiree from Wayne County, who is working as the Board’s Financial Advisor at $100k a year. After the Board approval, when EMA submitted the work plan, they have identified Mr. Benton as one of their employees – doing project coordination! So now the guy who got them to this client, who reviewed their report; who was apparently advising the Board on the matter, is now going to work for EMA! Wow! Can you believe this! Can you believe that no one has even questioned such an arrangement? The more things change, the more they remain the same at DWSD. It is a big Department with lots of money at stake. This is a daylight heist. To create and give out a $48 Million contract to a company out of Minnesota with majority of its project staff coming out of Toronto – something is out of place. City of Detroit (and surrounding community) is once again a laughing stock. 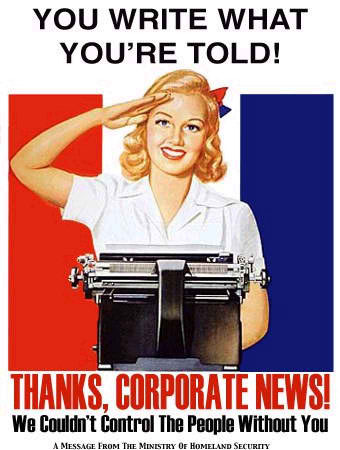 So the multimillion dollar question is – where are the freaking press and other stakeholders? lt is hard to imagine that the Director made such an overwhelming impression on the Board that they all were singing the same song; she is not that knowledgeable, and they are not that dumb. It is obvious that they were threatened and coerced in to submission by someone. Is there anyone who is going to question this corrupt system including the Judge, ‘the’ Chris Brown and the Director? Are the Commissioners on the take too? How about Council members? Who knows? This may be an opportunity for us stop the corrupt activity while it is in its early stages so we don’t have to say, ‘l told you so’ later on. I am afraid the non-suspecting Board members are going to get dragged in to this as they have much higher level of authority than before.